The average cost of memory care in Weld County is $4,926 per month. This is higher than the national median of $4,650. To help you with your search, browse the 2 reviews below for memory care facilities in Weld County. On average, consumers rate memory care in Weld County 4.0 out of 5 stars. Better rated regions include BROOMFIELD County with an average rating of 4.8 out of 5 stars. Caring.com has helped thousands of families find high-quality senior care. To speak with one of our Family Advisors about memory care options and costs in Weld County, call (855) 863-8283. Weld County, which is located in the north-central region of Colorado about 50 miles north of Denver, is home to nearly 305,000 residents and has a senior community that comprises about 12 percent of the population. In this county, nearly one in 10 seniors who are enrolled in Medicare are living with Alzheimer's disease or dementia. Weld County families who are seeking memory care services for loved ones have four local memory care facilities to choose, including two in Greeley, one in Broomfield and one in Evans. These memory care facilities are situated within assisted living facilities that have secure environments and specially trained staff. The air quality in Weld County is subpar, with the county receiving an F for ozone pollution and a C for short-term particle pollution from the American Lung Association. Because these types of pollution may adversely affect the health of seniors, this may be a consideration for some families researching local memory care options. 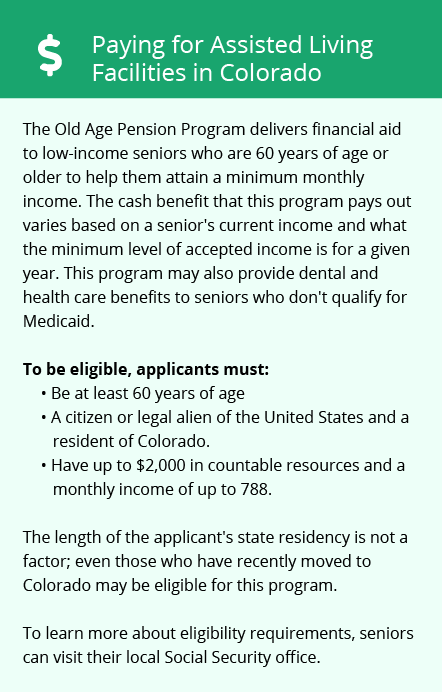 In Colorado, all forms of retirement income are subject to state income tax. However, there are significant deductions available to reduce how much seniors pay on their income. This may enable seniors to put more money toward memory care expenses in Weld County. Weld County is an expensive place to live relative to the national average, but it is fairly affordable when compared to the rest of the state. The overall cost of living is about 20 percent above the national average and about 11 percent below the state average. This may be a consideration for those looking for economically priced memory care services. On a 100-point scale, with a high score indicating high crime, the violent crime rate in Weld County is 37.9, which is several points higher than the national average of 31.1. The property crime rate is roughly on par with the national average at 38.5. To keep residents safe, memory care facilities have secured outdoor areas, as well as features like security cameras and alarm systems. Memory Care costs in Weld County start around $4,926 per month on average, while the nationwide average cost of memory care is $4,800 per month. It’s important to note that memory care rates in Weld County and the surrounding suburbs can vary widely based on factors such as location, the level of care needed, apartment size and the types of amenities offered at each community. Weld County and the surrounding area are home to numerous government agencies and non-profit organizations offering help for seniors searching for or currently residing in an assisted living community. These organizations can also provide assistance in a number of other eldercare services such as geriatric care management, elder law advice, estate planning, finding home care and health and wellness programs. To see a list of free memory care resources in Weld County, please visit our Assisted Living in Colorado page. 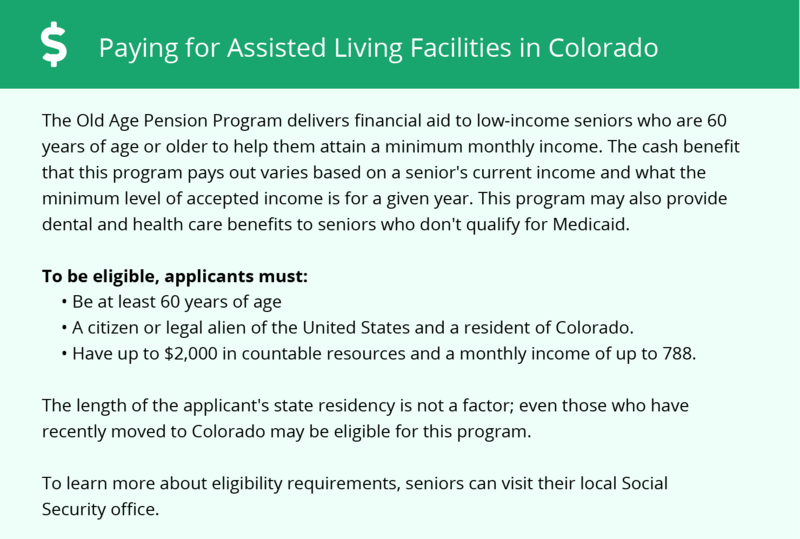 Weld County-area assisted living communities must adhere to the comprehensive set of state laws and regulations that all assisted living communities in Colorado are required to follow. Visit our Memory Care in Colorado page for more information about these laws.